More from around the city in the afternoon and evening. 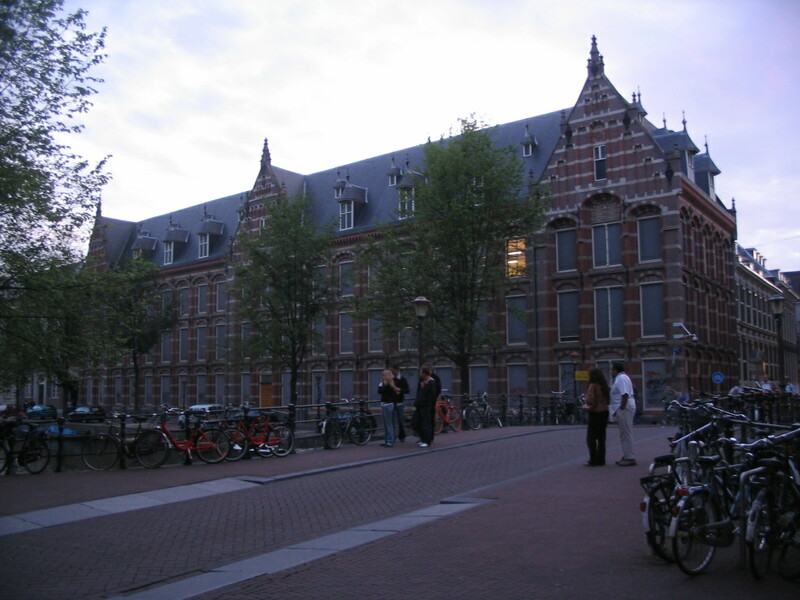 It's worth noting that while I was working on the immediately foregoing Amsterdam pages, King Willem Alexander acceded to the throne upon the abdication of his mother Queen Beatrix. Topical! 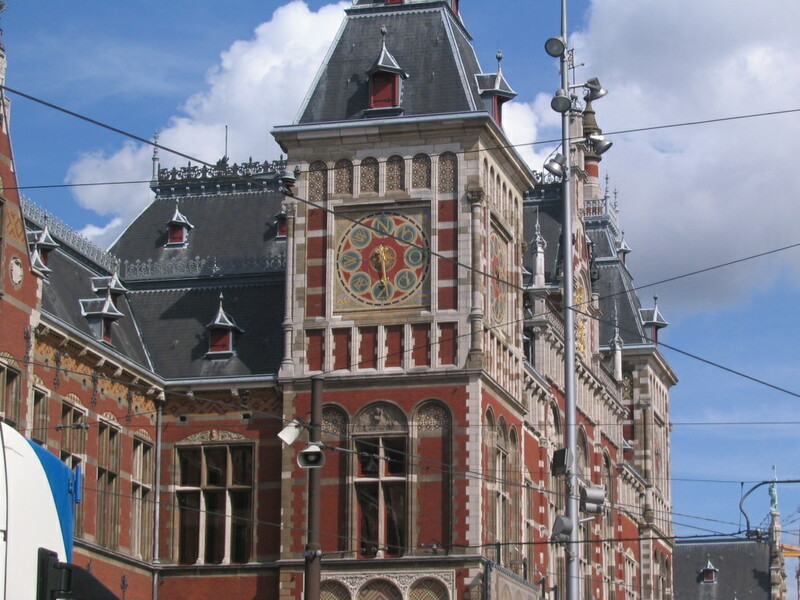 The Centraal Station has a clocklike wind direction indicator. I don't know whether it's mechanically connected to a weathervane or what, but it's pretty neat. 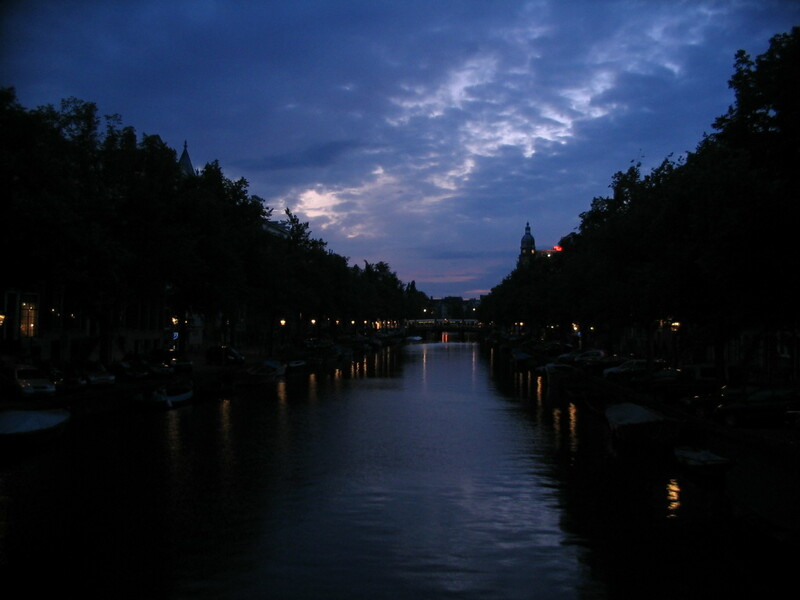 We took a tram ride out to the borough of Nieuw-West on the western periphery for a lecture on the history of Amsterdam's development. 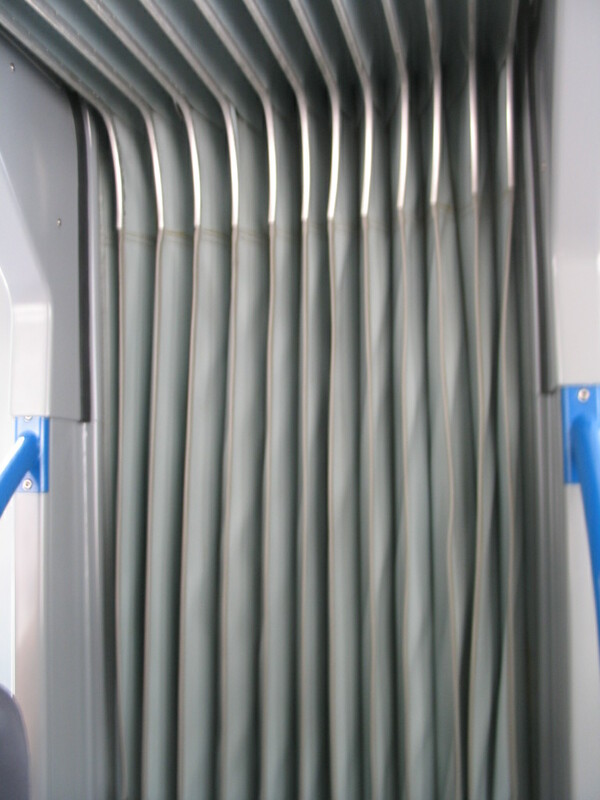 Watch your fingers! 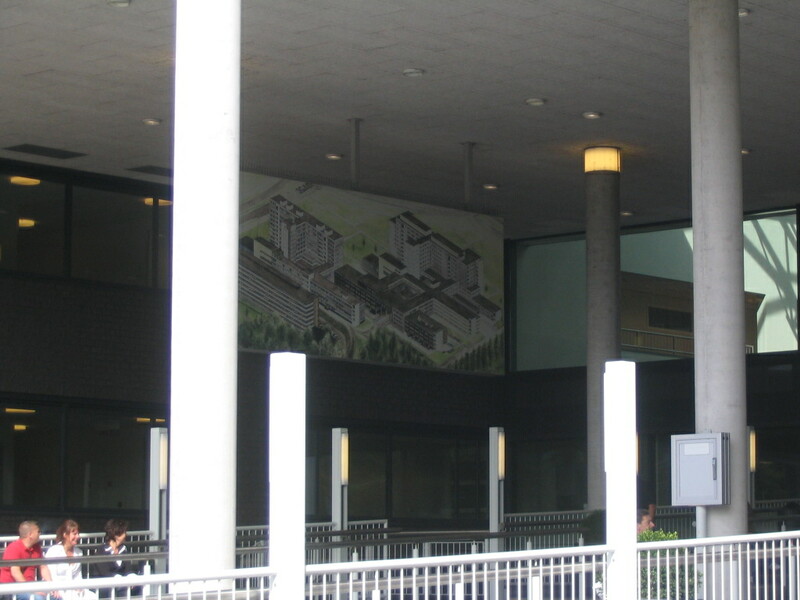 Along Jan Tooropstraat, a large portico at Sint Lucas Andreas Ziekenhuis (Hospital) with an isometric view of the hospital campus. 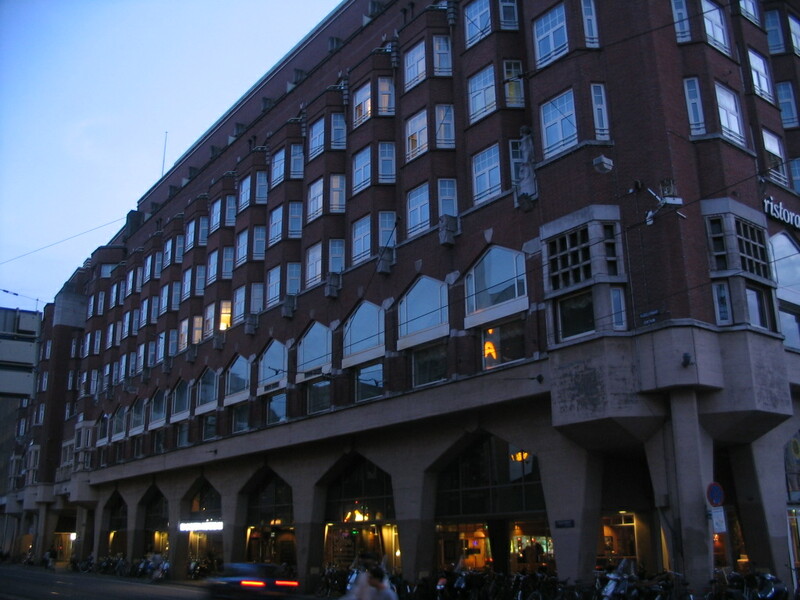 The building where we saw the lecture, the Vliegbasis de Huygens, is along Jan Evertsenstraat. 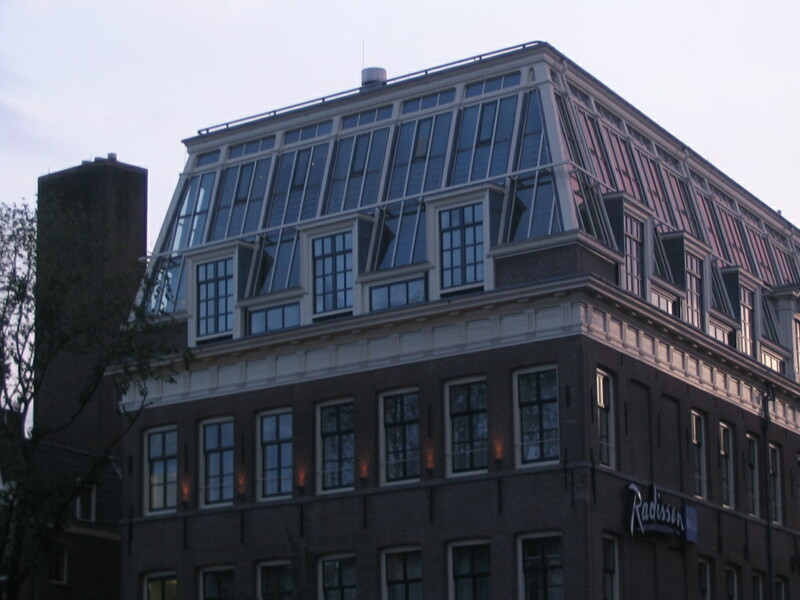 This other building with a series of cool curved monitors for a roof is immediately adjacent to or part of it. 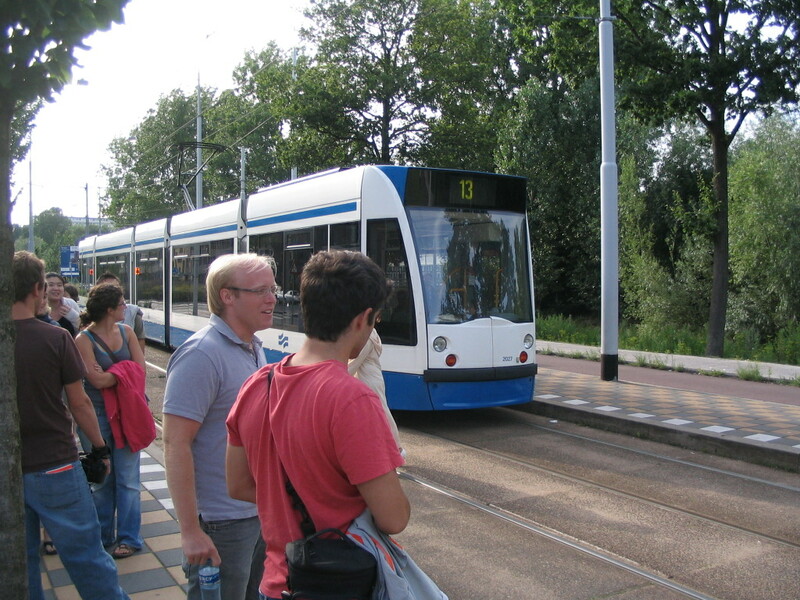 The friendly 13 tram arriving to take us back to the center after the lecture. 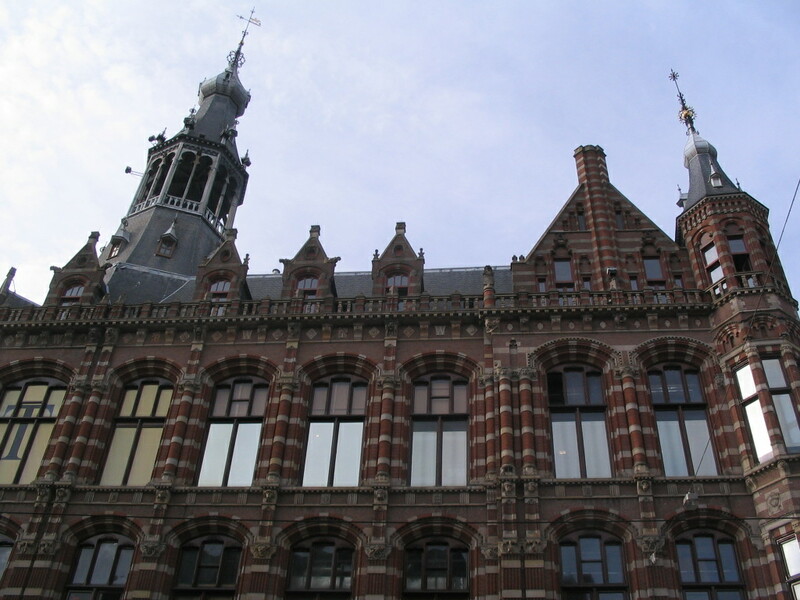 Back in the center: Magna Plaza, just behind the Royal Palace on Nieuwezijds Voorburgwal, a fin-de-siècle post office converted into a shopping mall. 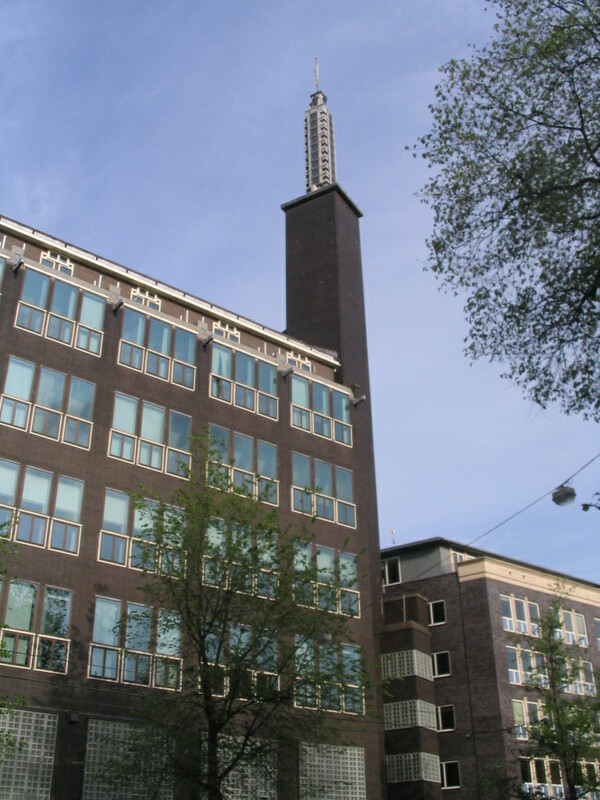 The old Telegraafgebouw further down Nieuwezijds Voorburgswal is, I think, in the Amsterdam School style, but its tower has a rather Nordic look. 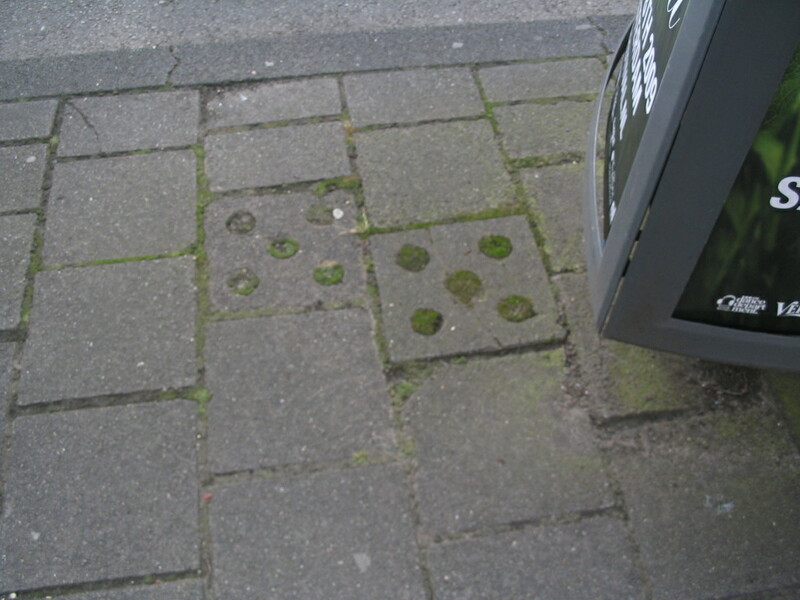 These mysterious perforated pavers must be some secret code. That's the simplest explanation. 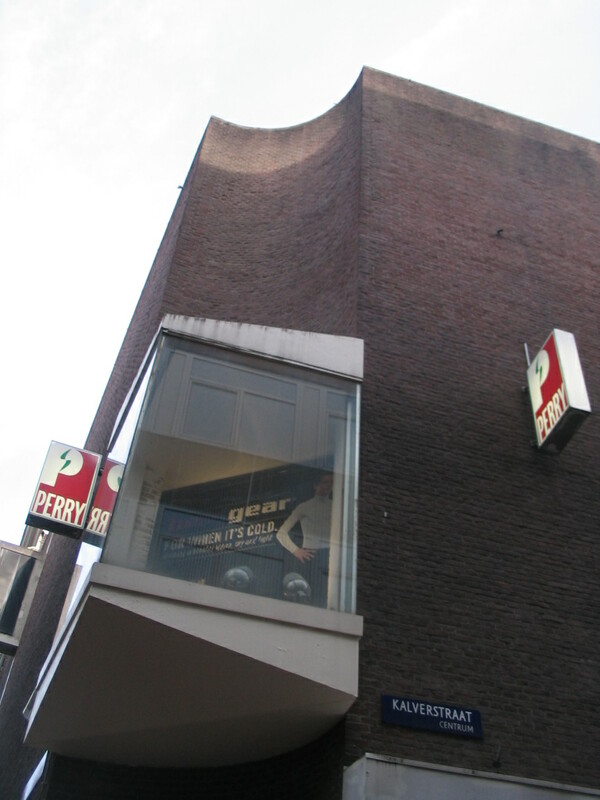 At the corner of Kalverstraat, a pedestrian shopping street, and the tiny Enge Kapelsteeg, is this curious concave wall hosting an even curiouser bay window. 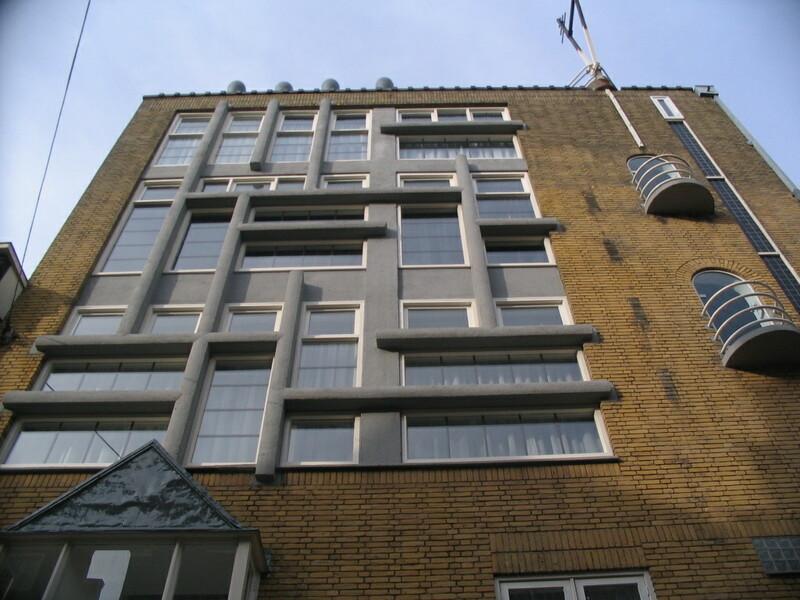 Further along on Kalverstraat, a rather fetching façade that seems stylistically somewhere between the Amsterdam School, Art Deco, and minimalized classicism. And then a very curious façade indeed, a rather Mondrianesque composition. 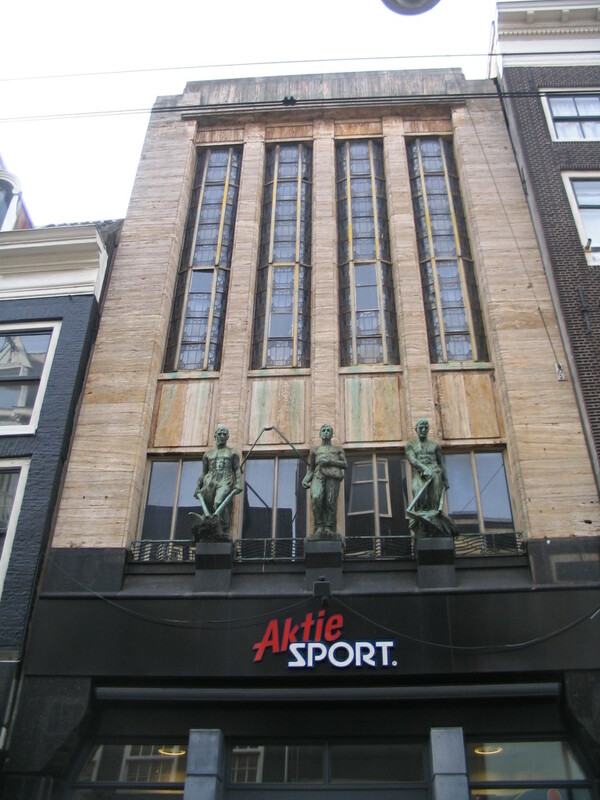 I'm not sure where this is, maybe still on Kalverstraat. 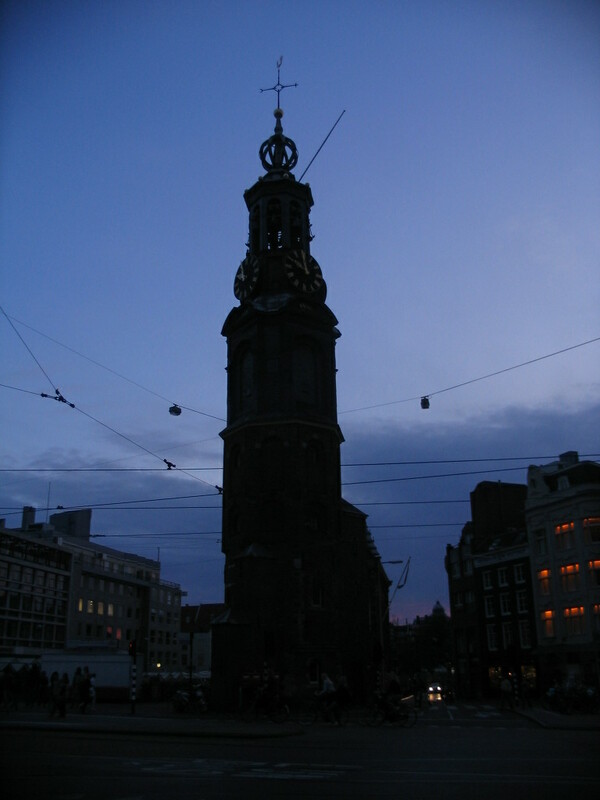 Out on the Muntplein stands the storied Munttoren. 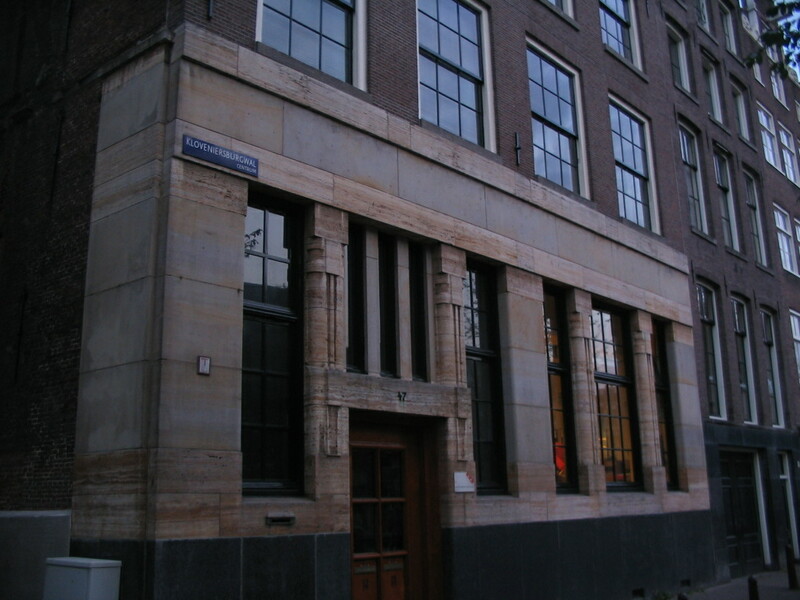 A few doors further down, a pleasingly solid stone façade. 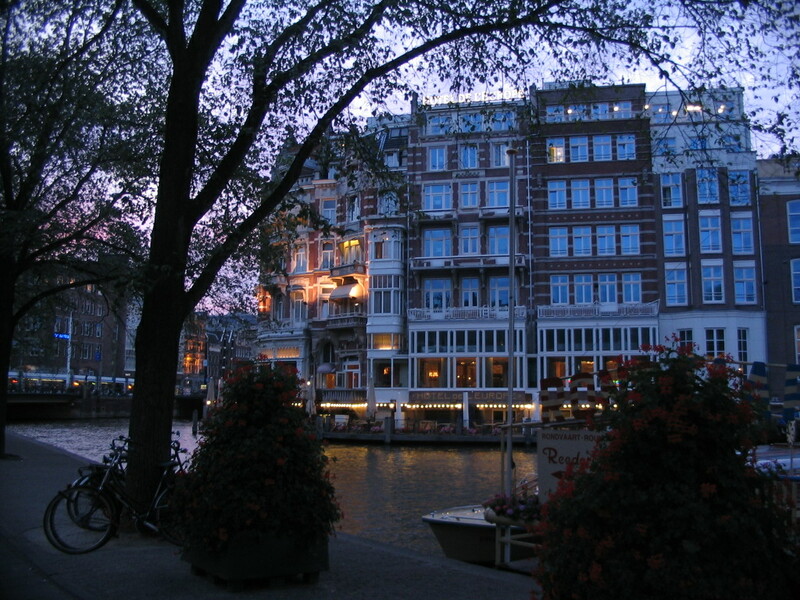 A charming twilight scene along the Raamgracht at its joint with the Kloveniersburgwal. 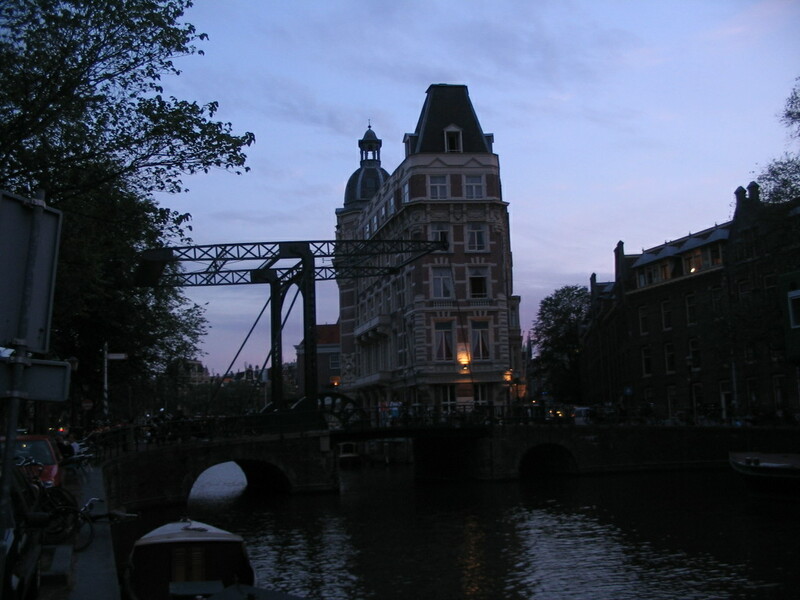 The Kloveniersburgwal joins at its southern end with the Amstel, past this totally sweet Staalstraat drawbridge and the wedge-shaped NH Doelen, Amsterdam's oldest hotel. 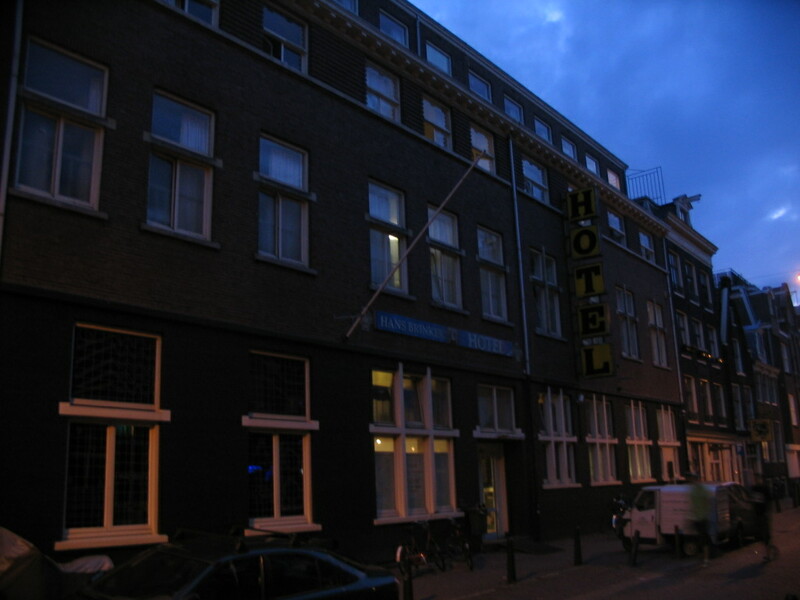 Across from the Amstel street, at the corner where the Amstel becomes the Rokin, is the similarly #swaggy Hotel de l'Europe. 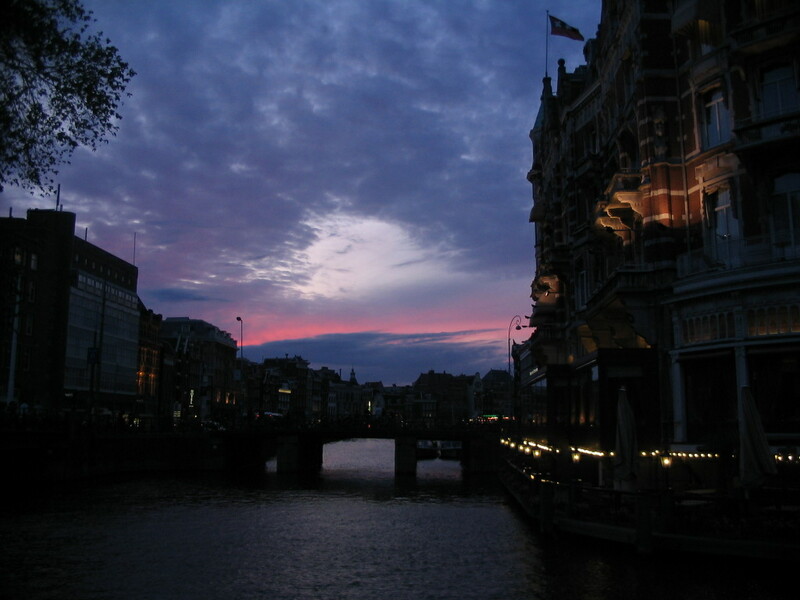 A choice bit of last glow over the Rokin. Hey what's this cool old tower with the wires and needles? 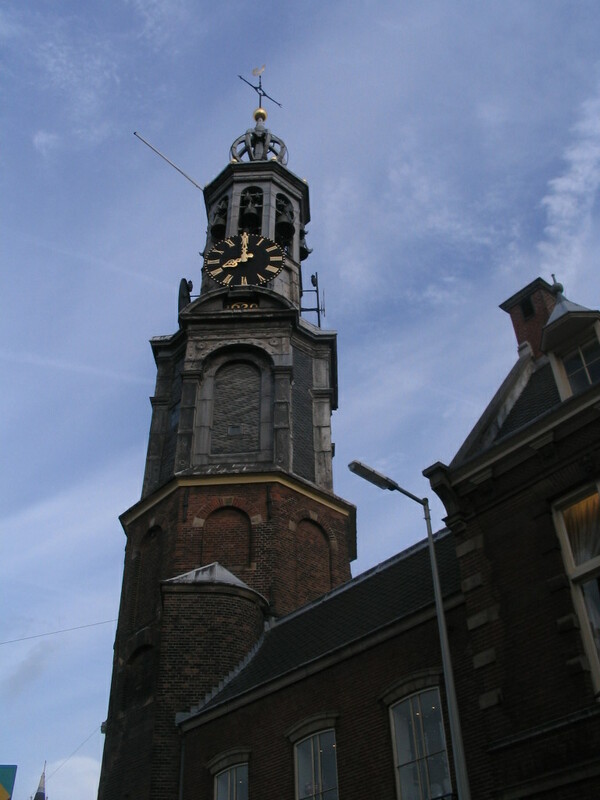 Hint: it's the Munttoren again. Just beyond, a fuller view of the Carlton. 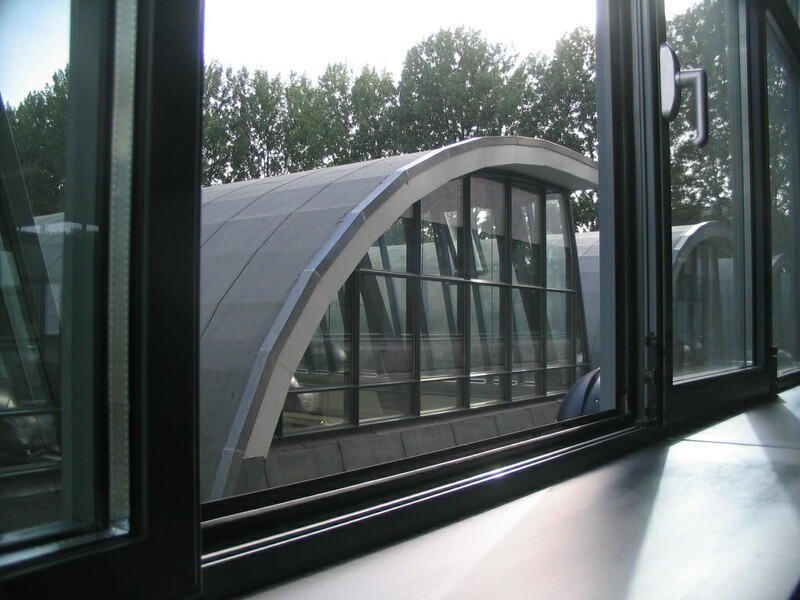 Its leglike piers rather remind me of Le Corbusier's Unité d'Habitation. 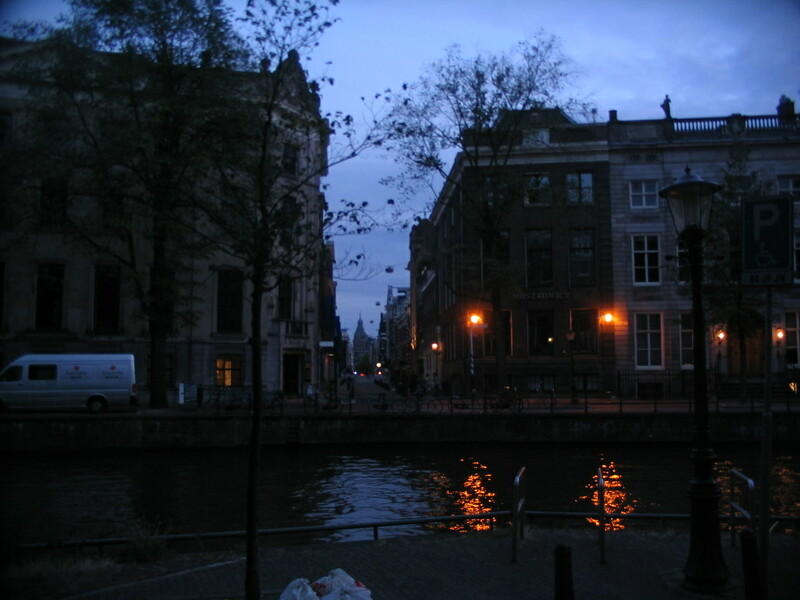 One of the really neat view alignments of the city is that at the end of the Nieuwe Spiegelstraat/Spiegelgracht you can see one of the towers of the Rijksmuseum, here viewed from the other end at the Herengracht. 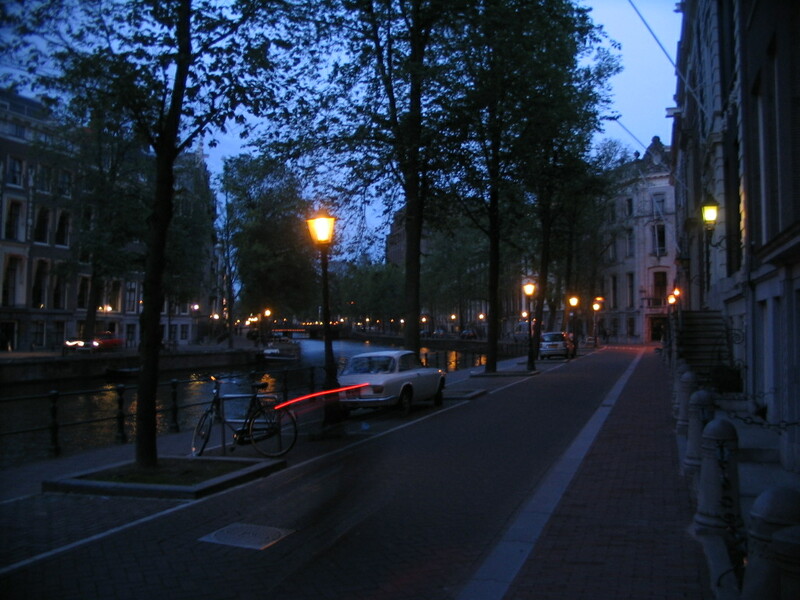 A ghost rider along the Herengracht in the deepening twilight, looking east toward Vijzelstraat. 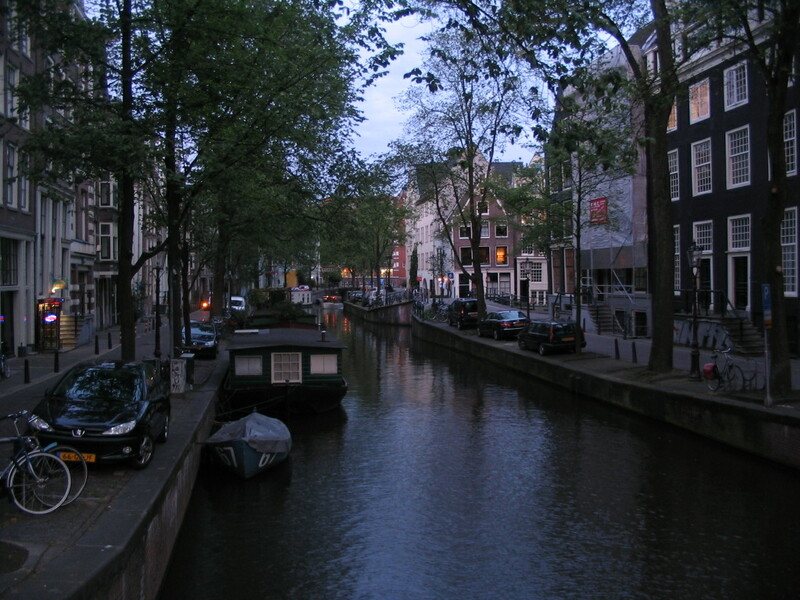 From the Nieuwe Spiegelstraat bridge, dusk approaches over the Keizersgracht and a tram trundles over the canal on the Leidsestraat in the distance. 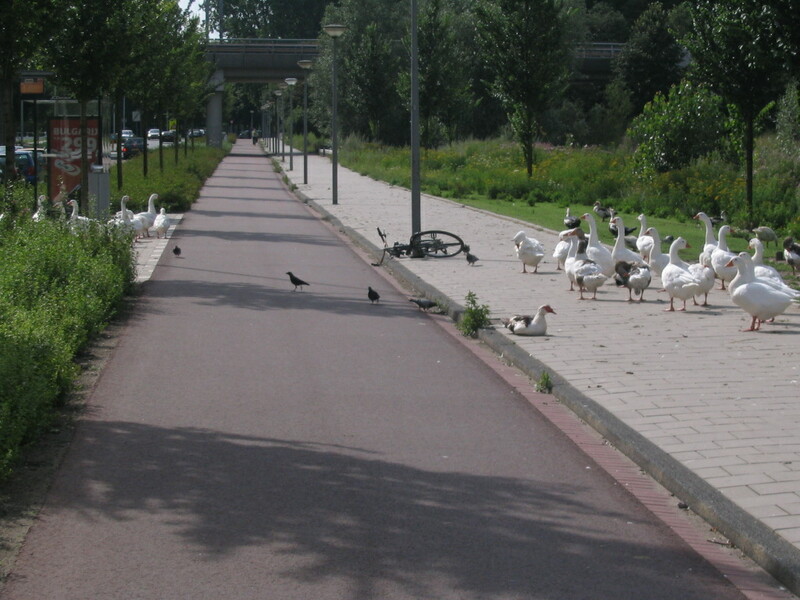 Finally back at the Hans Brinker right at isobrightness.